That’s Coast-to-Coast Cucumber Carriers, Inc.
C-to-C-C-C, Inc. is an international company loading, unloading, hauling, dumping, and otherwise transporting large, small, and medium cucumbers across the Greater Western Hemisphere. We like and prize our employees and hope they will stay with us for many years to come. We offer wonderful benefits: full dental, full vision, and partial medical (up to $20 per incident, per year—-thankfully the government takes care of the rest of that for us—just don’t expect to get expert care in quality time, and you may even have to wait a while), no 401K (most of those went out of fashion in late 2007 and we don’t think that the banks can take care of all that money anymore—besides, the longer you wait the less value that dollar will become, so go out now and get a big hefty mortgage on your house. Rest assured that the government will bail you out when you lose your job (that is, if your job is not with C-to-C-C-C, Inc….our employees NEVER lose their jobs) and pay your mortgage for you….or you could take a vacation to the Bahamas or the Caribbean, or buy a motor home and travel across the country in a machine that gets about 2 feet to the gallon….no, really, it’s okay! Go ahead and spend your grandchildren’s inheritance! ), and 10 unpaid vacation days a year. We can’t pay for vacation days because insurance and gas is so expensive. To make our employees feel special, we showcase an employee each month. This month, we would like to introduce you to Logan. Logan has been working for Coast to Coast Cucumber Carriers for quite a while. He is the ideal employee–energetic, resourceful, eager, helpful, and above all will take any wages offered to him. 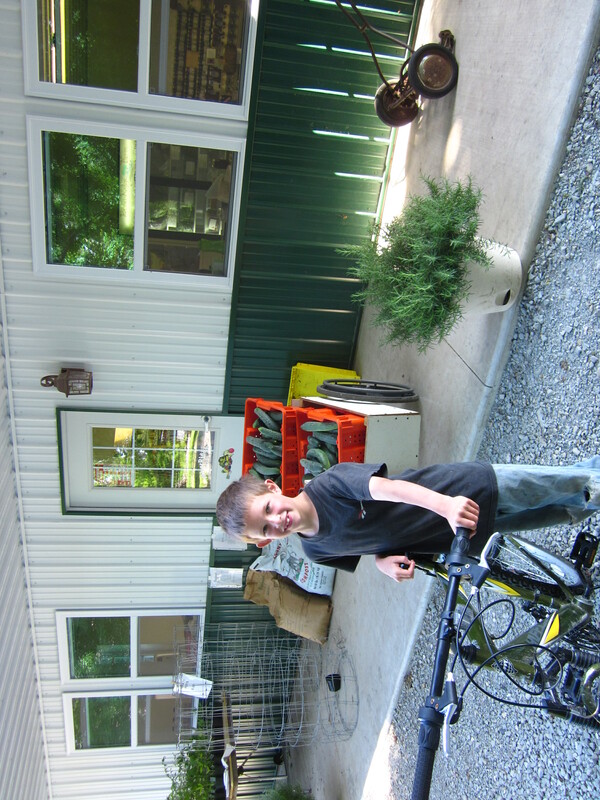 Logan helps transport cucumbers from greenhouses across the nation, to huge warehouses, department stores, and garages all across the Greater Western Hemisphere. Working long hard hours, Logan is of great value to us and we hope he will continue with our company for many years. Thank you Logan for working with us! 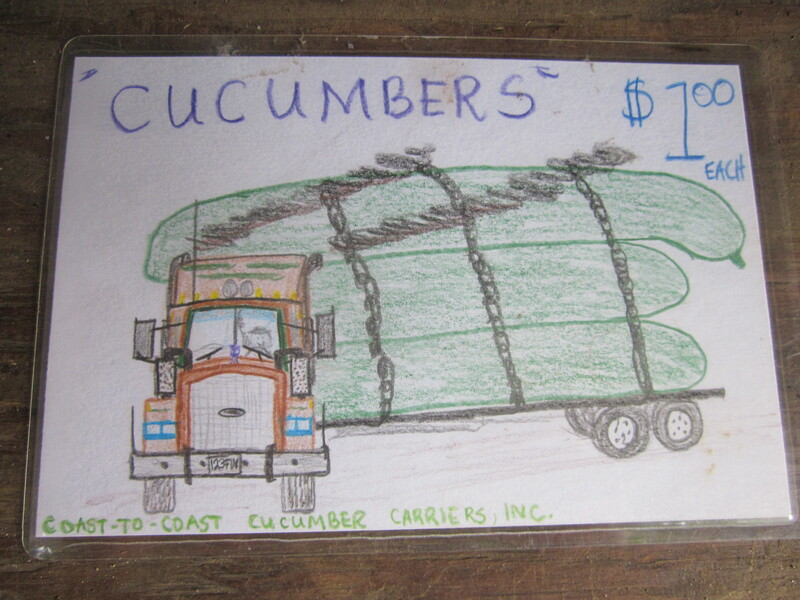 We love your post and don’t think Logan drew the darling cucumber-hauling semi, and do think we know who drew it. It has a familiar style!!! Every detail is there, as usual. Thank you!! Sending you much love and many hugs…. Love the drawing . . . and Wow! the cucumbers grown in Indiana are bigger than Douglas Fir trees! !